It's not everyday that I review a book here. As a matter of fact it's been months and months since I have done one and there are some very good reasons for that. The first reasons is, I am an author not a book reviewer. I do read books, rarely do I stop; however, I don't like giving bad reviews because writing is an art form. I could look at a priceless Picasso and think, what a load of absolute crap. And that helps no one. Another, more pressing reasons is-- people won't stop asking me to do book reviews. I get an obscure number of people reuqesting on twitter, Goodreads, and even via comments on my blog to accept a FREE copy of their book and write them a review. I never know these people, nor have I heard of them; and if I even took up half their offers I'd never have time to write anything of my own. But I do sometimes write book reviews on Amazon and Goodreads without being asked. It's not that I don't want to help you, it's just that we should maybe get to know each other first. All book reviews, of all awesome books. Well at least three of them. 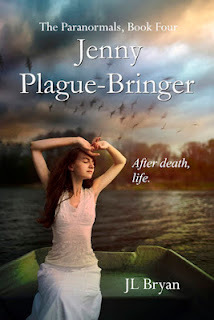 Today I am reviewing Jenny Plague--Bringer by JLBryan. I bought the book myself here. As soon as I could get my pretty little Skeleton hands on it. I breezed through it in less than 24 hours with 5 kids, and looming deadlines. It wasn't that I couldn't put it down, because I had to; it was that it drove me insane until I picked it back up again. It's an odd thing, living through two worlds in the same book. There is unraveling nonstop. Even though the book opens with what seems to be a happy ending, Jenny feels as though it is impossible for her to really have one. Dozens of other lifetimes with with horrible ends threaten to consume her, even as her beautiful love story continues on. Then Jenny finds out she is pregnant, and things go from looming disaster to all out panic. I love Seth, Jenny's opposite and baby daddy in this book. He is a rock that refuses to crumble as their life together cracks like glass that should have bever been tread on below their feet. As much as I wish it wasn't the last, JPB was an amazing and artful end to the series I have grown to love. It's hard to believe how long it's been since I first heard of JL from Amanda Hocking. Jenny Pox, the first book in the series, is free on Amazon. I suggest you pick it up and start this amazing paranormal adventure for yourself.